Ancient Stones - Borders - 035 Standing Stone, Drumelzier, Broughton. This substantial standing stone, situated on a slight elevation beside the River Tweed, is wedge-shaped at the top and measures 1.65m high x 0.95m wide x 0.55m thick. The surrounding area is low lying flood plain and prior to being drained, would be been wet and boggy. This small area of raised ground would have provided a prominent and secure location for the sighting of the stone. Drumelzier is on the B712 Peebles to Broughton road. The best way to reach the stone is to follow the track beside the Drumelzier Burn to the west of the village. Head for the river and follow the bank downstream. A line of electricity pylons marks the field containing the stone. In Drumelzier village, beside bridge, outside village hall. 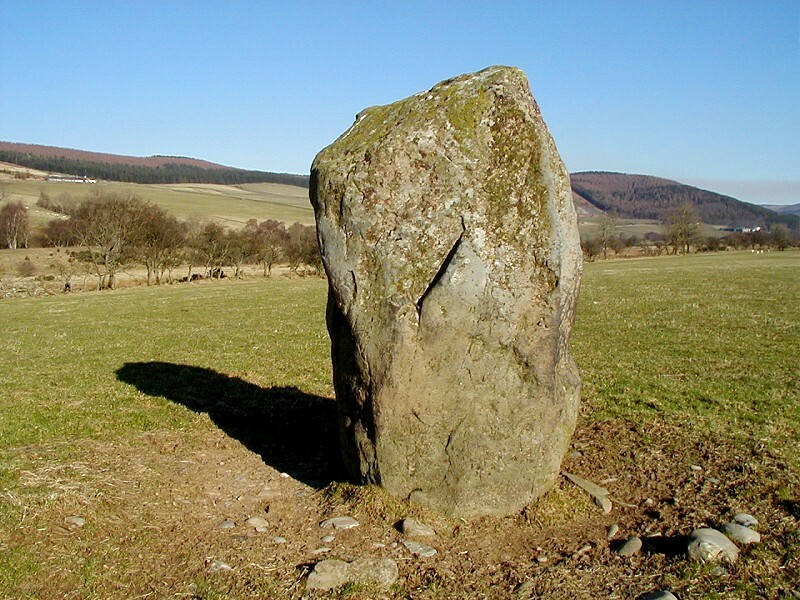 There is no specific folklore directly associated with this standing stone but according to legend which is at least as old as the 15th century, the wizard Merlin was buried 183m NNW of Drumelzier Church, on the level haugh close to the right bank of the River Tweed. No structural remains are now to be seen, or have ever been recorded, at the place in question, but it is possible that the tradition may have been originated from the discovery of a Bronze Age cist in the area. The following legend has also been found in connection with this location. Merlin was converted to Christianity by St Kentigern at the alter-stone a large block of rock opposite Altarstone Farm in the parish of Stobo. The following day Merlin met a strange three fold death, as he had already prophesied. He was stoned by local shepherds, slipped down the banks of the Tweed and impaled himself on stakes used to secure fish traps. He drowned as the river unexpectantly rose and his head fell below the water level. Two points of interest were noted during a visit to this standing stone on this occasion. One is that the main "flat" axis of the stone is in a direct alignment with the scant remains of the mediaeval Tinnis Castle, some 3/4 of a mile to the south. The castle is constructed on an earlier Iron Age hill fort. A possible alignment may exist in the opposite direction taking in Trahenna Hill to a burial cairn on Pyked Stane Hill, although this has not been checked on the ground. The second point of interest is the possibility that this stone marks a crossing point or ford along the River Tweed. 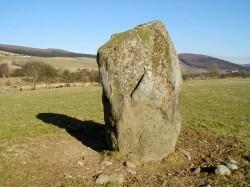 A similar stone exists at the Standing Stone in Cardrona, Peebles where a ford is recorded and in use until recent times. No ford has yet been located at Drumelzier although it is likely to have existed. Usually you can gleam some suggestions as to the purpose of a standing stone, often by the proximity of other nearby prehistoric structures. However, this stone poses a problem. While there are other features on the surrounding area, none are close by and the location would almost certainly have been marshland or bog, forming the floodplain of the River Tweed. The stone does stand on a slightly raised knoll of drier ground and might have been used as an important place of worship or ritual. Local legend connects the stone with the burial place of Merlin and this ties in well with the possible but unrecorded discovery of a Bronze Age cist. This site is proposed to be 183m NNW of Drumelzier Kirk, over 1km from the stone. Also of interest in the area is a stepping stone or style set in the wall leading to the garden of Drumelzier Haugh farm. The style is on an approximate line between the standing stone and the high ground around the ruins of Tinnis Castle, itself constructed on an Iron Age hill fort and settlement. Now, this stone feature may be recent but does hint at the tradition of not blocking the "fairy path", when superstitious people where fearful of obstructing any pathway (ley?) that was used by the Little People, to do so would bring bad luck. A similar feature was found at Menzion, Tweedsmuir.